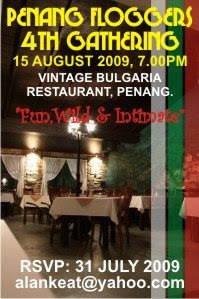 Coming August 15th is the 4th Penang Bloggers Gathering in Vintage Bulgaria Restaurant in Penang. If you’re interested to meet all the bloggers in town and network with them… this is the best opportunity. any special sponsor for this event?